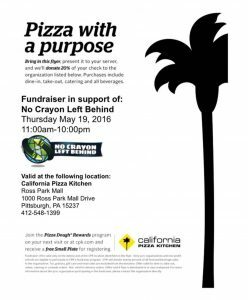 California Pizza Kitchen at the Ross Park Mall is providing an easy and delicious way to help us bring color to children everywhere! Simply show the post with this image or mention that you’re there to support No Crayon Left Behind, and they will donate a significant portion of your bill — eat-in or take-out — to our organization! So please show your support THIS THURSDAY, May 19th, by grabbing a fantastic meal for yourself, your friends, your family… and you’ll enable us to give the joy of self-expression and creativity to thousands of children across the U.S. and the farthest corners of the world.